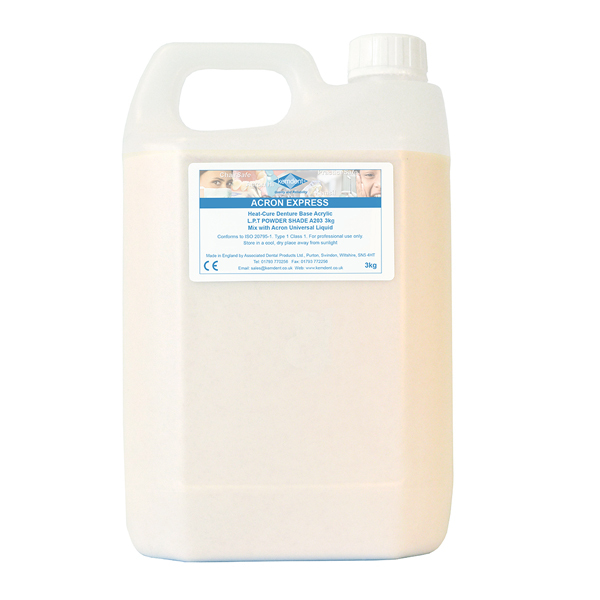 Acron Express is a super-fast dough, heat-cured denture base acrylic designed for the manufacture of full or partial dentures, and is ideal for busy prosthetic laboratories and urgent cases. It takes just seven minutes to reach the dough stage, so laboratories can start packing jobs much sooner. What's more, once it has reached the dough stage, Acron Express stays packable for longer because it has an extended working time of at least 30 minutes at room temperature, allowing laboratories to process more jobs at the same time without loss of quality. Then it can be processed using either a rapid (20 min) or longer cycle in boiling water. Acron Express produces dentures with exceptional high strength and a high lustre finish. It is easy to trim and polish. 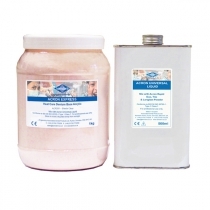 This superfast dough acrylic is available in 'Light Pink Translucent' and 'Pink Veined' shades. Acron Express does not just save technician time and money, when it is used correctly with a good wax-up technique and high-quality denture teeth it will create a denture that offers strength, a more accurate fit, excellent true-to-life appearance and overall comfort for the patient, giving the patient the confidence to smile again.